Sara Zarr’s debut novel Story of a Girl kept me turning the pages far past my bedtime – a sure indicator of its quality. I read before bed and most nights I’m lucky if I manage a couple dozen pages, but last night I settled in early and once I started, I couldn’t stop. Deanna had been parking with Tommy for a year before she’s finally caught, but her dad’s discovery of her in a compromising position casts the reality of her life in a harsh light. Now her dad can barely look at her. And when the novel opens, at the end of sophomore year (that’s grade ten here in Canada), it’s clear that the story of her tryst with Tommy is still the topic du jour in her small hometown of Pacifica, a sea-side suburb of San Francisco. At least pretty much everyone at Deanna’s high school knows about it – or some version of it. The only people who don’t care are her two best friends: Jason, a boy she’s known forever and Lee, a girl who moved to Pacifica after the incident. Story of a Girl takes place during the summer between sophomore and junior year. Deanna’s strained relationship with her dad causes her to daydream about leaving home and living with her older brother Darren, his girlfriend, Stacy and their infant daughter, April. Currently they live in the basement. Stacy and Deanna’s dad don’t get along. In fact, Deanna’s household is pretty dysfunctional and so Deanna quickly finds work at a local pizza dive…where, it turns out, Tommy also works. What I loved about this book was how realistic it seemed. Everyone judges Deanna for a decision she made when she was thirteen, but it isn’t until she comes into contact with Tommy again that she figures out why she always went off with him. And forgiving him – and herself – also allows her to empathize with her father. …I imagined us through his eyes – his family, sitting in a pink kitchen: his tired wife, who never complained; his son who looked exactly like him; his daughter, who used to be the baby, his baby girl; and now April, his grand-daughter, who had a whole life in front of her, with no real mistakes in it yet. Could he look at us someday, I wondered, maybe today, and not be disappointed? Could he see us, and himself, for who we really were? Big love for this book. 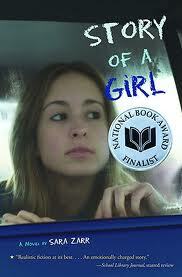 This entry was posted in Book Chat and tagged 2013, Book Review, highly recommended, mature teen, teen, YA by Christie. Bookmark the permalink.